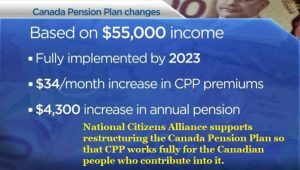 The National Citizens Alliance supports restructuring the Canada Pension Plan (CPP) in favour of the Canadian people who contribute to the plan. This policy statement will be updated with a specific NCA plan to restructure the Canada Pension Plan. The Restructure Canada Pension Plan policy statement will require a vote of the NCA membership to be adopted. A minimum 70 percent voting membership must support the policy and with a 50 percent quorum of voting membership as per the NCA Constitution (2014).